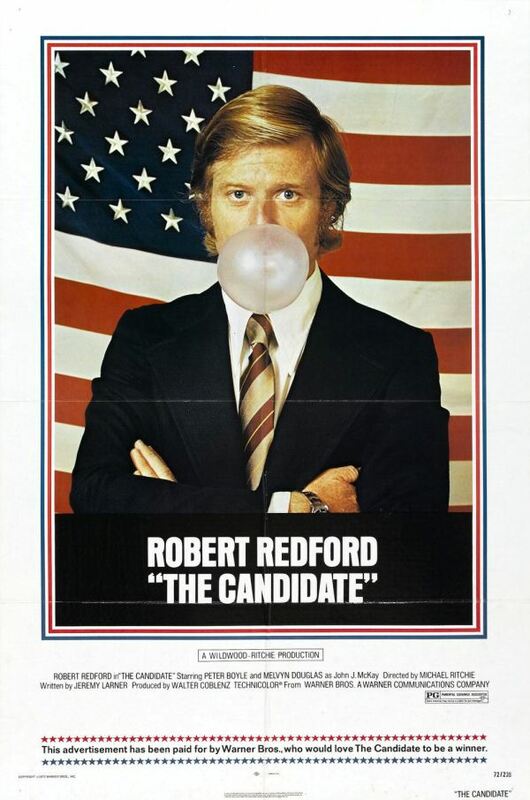 4-Word Review: Robert Redford for President. In commemoration of Election Day and the fact that all the campaigning and political punditry will finally be coming to a merciful end we present a rare Tuesday post here at Scopophilia. Although done 40 years ago this wry look at the inner-workings of the political campaign trail is as incisive and timely as ever and hasn’t lost any of its punch. The story deals with Bill McKay (Robert Redford) a young lawyer from California who is persuaded to run for senate against the incumbent Crocker Jarman (Don Porter). McKay represents the youthful idealism while Crocker is very entrenched with the establishment. The film was directed by Michael Ritchie who may not be a household name, but he is the creator of his own genre. He took the examination of competition and how embedded it is in American culture to new heights. Through his various movies he showed how it infiltrates every aspect of our society and no one is immune to it. From Smile to The Bad News Bears and Downhill Racer he showed how even the most unlikely of individuals can become fiercely competitive when driven. He also made his characters strangely endearing no matter how sordid or ugly the competition made them become. This film works along those same lines only it shows it from a political perspective. It is smart, fast, cynical, funny, dramatic, revealing, and entertaining all at the same time. This should rank as one of the best movies made about political campaigning. It’s still timely and cutting edge and works almost like a documentary. The quick editing creates a seamless style. The film makes interesting observations without taking away from the flow of the story. In fact one of the reasons it is so captivating is because it is downright educational. When the film is over you feel much wiser to the business of politics and as exhausted as the candidate himself. Redford is terrific. He has a real gift for underplaying everything to the point that it looks like he isn’t even acting at all. He plays off his pretty boy looks, but doesn’t stay trapped to a heroic image. He harbors a lot of idealistic traits one would want in a candidate and yet he is still quite human. There are some definite shades of John F. Kennedy here. He has a troubled marriage and is even caught fooling around with an admiring female supporter. Although he has honorable ideas he is far from having all the answers. Probably the most interesting insight of this movie is the fact that he ends up getting as sucked into the mechanics and compromises of the political machine as his ‘old school’ foe. It perfectly illustrates how immense and encompassing the political machine is and how no one is really going to change it. This is an excellent and well-crafted picture that not only hits the bulls- eye, but does it many times over. I love Redford’s final line and Boyle, as his campaign manager, has never been better.